Cheques or money orders payable to the “College of Midwives of Ontario.” Applicant’s name must be indicated on the front of each cheque or money order. If paying by installment, all cheques or money orders must be provided to the College with the registration application. The College registration year is from October 1st to September 30th. 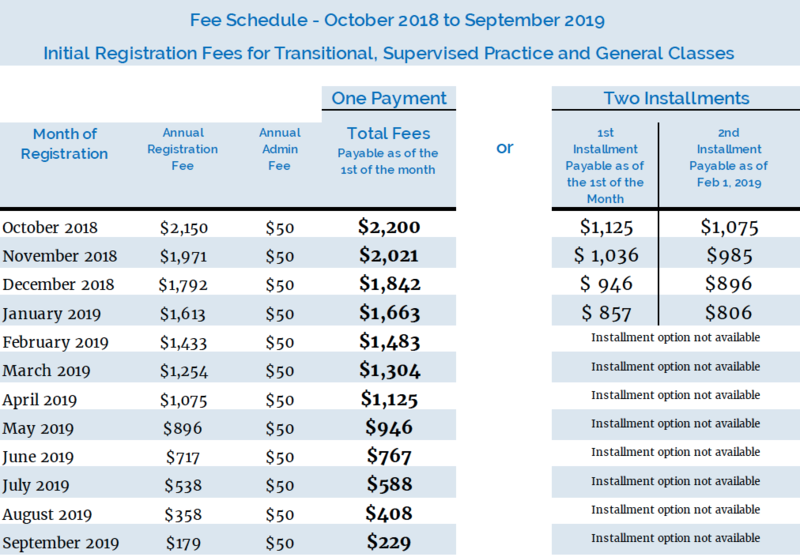 The fees on this schedule are for the registration year October 1, 2018 to September 30, 2019. If you are initially registered during the October 1, 2018 to September 30, 2019 registration year, your registration expires on September 30, 2019 and must be renewed by October 1, 2019 to avoid the suspension of your registration and a penalty fee. Renewal information will be forwarded and available in the Member Portal of the College website in August 2019.